It might have taken 13 games, 1051 minutes and 29 shots, but Michael Smith's goalscoring drought for Rotherham is finally over. The striker has been leading the line brilliantly for the Millers in recent weeks and his performances had only been missing goals. Not since the 1-0 win over Ipswich in August had Smith found the back of the net, but that was not for lack of trying. And at last he saw the net ripple at Deepdale to earn his side a 1-1 draw at Preston. Early in the second half Smith controlled Ryan Williams' cross and sent his shot-on-the-turn into the roof of the net to cancel out Tom Barkhuizen's first-half opener for North End. It looked like being more of the same frustration for the target man after he again rattled the woodwork for the second time in three matches, but he eventually got his reward. 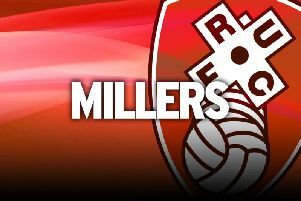 The draw doubled Rotherham's away tally for the season after the midweek stalemate at Middlesbrough as the Millers are finally turning performances into points on the road after six successive defeats to start the season. The wait for an elusive win at this level – now at 33 games – goes on but boss Paul Warne felt his side were worthy of their point at Deepdale after a disappointing first-half showing. “I think the lads did enough to earn a draw,” Warne said. “Smithy had a great chance in the first half when he smacked the post to put us in front. “They made a great save from Vass (Kyle Vassell). Smithy got the goal we deserved and we were deserving of a point. It might have an even better afternoon for the Millers had Smith's low shot from 20 yards gone in rather than hitting the post, before the game took a familiar route. On the brink of half-time Barkhuizen beat his man at the near post from a Callum Robinson corner and headed home to put Preston in front. Warne's words at half-time did the trick as not long after Kyle Vassell was denied Smith grabbed his goal that his superb displays of recent weeks had warranted.